Several more elected officials and community groups yesterday joined the call for the Empire State Development Corporation (ESDC) to extend the time for review of the Atlantic Yards project—but there’s no evidence the powers that be are listening yet. State Assembly member Annette Robinson and a representative of Congresswoman Nydia Velazquez joined the elected officials—including State Senator Velmanette Montgomery and City Council Member Letitia James—at a press conference yesterday afternoon at City Hall. Still, none of the officials who had previously asked for more time to consider the Draft Environmental Impact Statement (DEIS) had heard anything from the ESDC--and Mayor Mike Bloomberg, a booster of the plan, has refused to join the call. “The response from the mayor is he believes that Atlantic Yards should go forward,” James (at podium above) said. The ESDC released documents on July 18 and scheduled a public hearing for August 23, with September 22 the close of the comment period. 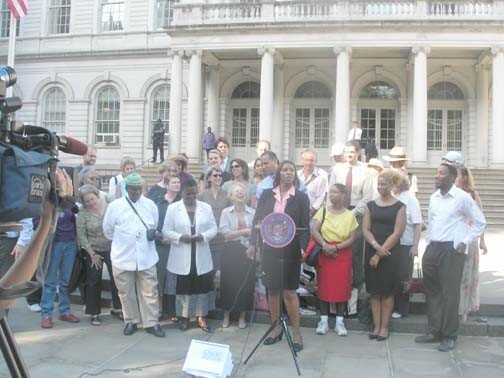 Joining MAS, the Council of Brooklyn Neighborhoods (CBN), and representatives of Brooklyn Community Boards 2, 6, & 8 were advocates from Citizens Union, the NYPIRG Straphangers Campaign, New Yorkers for Parks, and the Women’s City Club. Also present was Bill Batson, candidate for the open seat in 57th Assembly District, which would encompass the project, and a representative of Congressman Major Owens. Those assembled agreed on the need for an extended review, some saying 30 additional days, and more advocating two additional months, pointing to other projects that had received at least 120 days for review, including the Yankee Stadium project. Still, they differed in their posture to the project in general; some clearly oppose the project, while others, like Robinson, confined their criticism to the process. CBN’s Jim Vogel early in the press conference hefted two bulky binders containing some two thousand pages of documents from the DEIS, and pointed out that an associated document, the General Project Plan, was also more than a thousand pages. Tom Angotti of the Hunter College Center for Community Planning and Development said that experts reviewing the DEIS in anticipation of the planned August 23 hearing and September 22 close for comments are facing enormous pressures. “To begin, we have to have all the information,” he said, citing insufficient details in sections like transportation, air quality, and infrastructure. Just Wednesday, he said, the group received some of the basic data it has requested. “At the same time, we also have a five-page request for additional information” on issues like traffic, open space, and urban design, he said. For example, he said, in order to evaluate the impact on open space, those studying it need to get sufficient details on existing open space, but the DEIS does not provide sufficient information. Moreover, it’s difficult to assess the impact of the planned 7+ acres of open space at the project, he said, because the DEIS does not specify its location or the footprints of the buildings around it. While letters from the police and fire departments in the DEIS say that the project would not adversely impact response times, Angotti said there were no background documents that allowed evaluation of such statements. Last night, a community meeting on the DEIS sponsored by the Fort Greene Association and the Society for Clinton Hill drew several hundred people to the Church of All Saints. (I counted 150 early on; see comment for an organizer's statement that there were 300.) CBN’s Vogel and Deb Howard led the audience through the seemingly complicated task of searching the DEIS and focusing on specific chapters or topics of interest. They also advocated attendees to lobby state officials about the review process and the plan. Despite the concern in the room, the screen was small and the sound system flawed, so many in the racially-mixed crowd didn’t stay through to the end--but they did tote away numerous documents and posters to share with neighbors and recruit people to the hearing next Wednesday. Vogel advised those reading the DEIS to look for errors of fact, missing information, lack of clarity, and methodology that leads to predetermined conclusions. “Write from your heart," he said. "Rewrite from your head.” Further advice is on the CBN web site. Some in the crowd snickered when Vogel declared that the DEIS said there were no adverse impacts on the infrastructure, the Gowanus Canal, and the sewer system. Will traffic trip it up? One person in the audience asked what of the many sections in the DEIS was most vulnerable to criticism. Vogel demurred, saying that CBN’s job was to assist the community in general. Council Member James, however, felt no such stricture, and she suggested that "the most important issue is traffic and congestion. I think that will have an impact on the decision." She declared that "this is not an issue of simple slogans--'jobs and affordable housing'"--adding that she had been a longtime advocate of affordable housing. She pointed out that the DEIS didn't address the affect of the project at the Cumberland Gardens senior center across Atlantic Avenue, and that the project would exacerbate asthma at the Atlantic Terminal 4B public housing project. One questioner had earlier suggested that there was a racial divide among supporters and opponents of the project. Indeed, many of the most vocal community proponents are black, while a majority of the most vocal opponents, while part of a more diverse group, are white. James doesn't believe that represents community sentiment. "The silent majority of people, black and white, tell me this project is too large," she said. "I will not let anybody exploit the issue of race, as Forest City Ratner has done." Norm, good review of the meeting. However, there were over 300 people in the room. I helped set up the chairs, so I know exactly how many chairs per row and how many rows. There were 300+. Next time we meet in that otherwise wonderful room, the large fan will be off and there will be a huge screen or none of that type of thing at all.